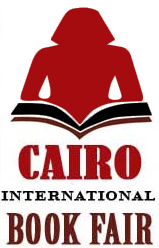 If you haven’t been to the Cairo International Book Fair yet – held annually at the Nasr City fairgrounds (map) during the last week of January and spilling into the first week of February – you should check it out. CIBF is the Arab world’s oldest and largest book fair, and in recent years it has drawn over one million visitors each year. 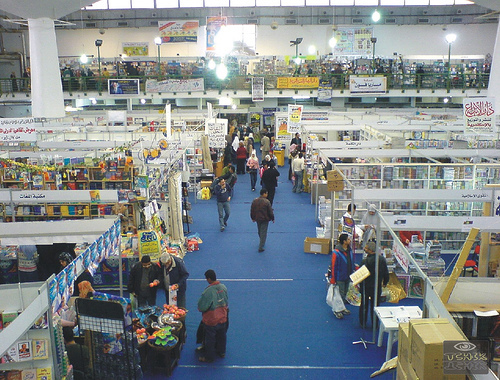 The aims of the fair are to provide a large, well-stocked market of books to an Egyptian audience, facilitate cultural exchange and discussion, and ease relations between authors, publishers, and readers, and the fair is just that, complete with plenty of families and a relaxed atmosphere. A visit on your own, with friends, or with your family is an excellent way to spend a morning, afternoon, or evening. While there you can wander through the many halls of Egyptian and foreign bookstalls, rummage through the Azbakeya tent for cheap, used books, stop by the guest of honor’s tent to see which country is being featured this year, swing by the Cultural Café for some lively discussion and often heated debates, check out signing events and readings by prominent and up-and-coming authors, or take a break at one of the many food stalls/restaurants. This is the best and sometimes the only place to get many books that are published outside of Egypt and also a good time to stock up on titles put out by Egyptian publishers (both private and government-run), as most houses offer significant discounts both at their stalls at the fair and at their regular locations in the city. You can visit CIBF’s website (link above; Note: the site often goes down and only sometimes has an English site, so you may need to visit it a few times) for a searchable directory of publishers, a map of the fairgrounds, and a schedule of events. Admission is very reasonable, about 1 L.E for adults. Distribution of books in the Arab world has long been a problem, and publishers are still trying to figure out how best to coordinate their efforts and encourage a more fruitful international distribution program. For example, in 2011 the Abu Dhabi International Book Fair featured a training session for publishers at which there was much of the usual discussion about how to better market books, as well as how to foster a more cooperative approach to publishing and distribution across Arab countries. As it stands, the vast majority of Arab publishing houses and bookstores are fairly small and operate mostly within their own countries. Some have partnerships with other bookstores and houses located throughout the Arab world, but it is very difficult for a book to cross country borders, and the vast majority of titles never leave their city of publication, much less the country. Book fairs have sprung up in the Arab world as one means to address this lack and bring readers, bookstores, and libraries a larger selection of titles annually. Founded in 1969, the CIBF is organized by the General Egyptian Book Organization and has grown from its initial size of 462 publishers hailing from 47 countries bringing with them approximately 100,000 books, to roughly 800 publishers in 2013 with roughly 2 million books for sale. 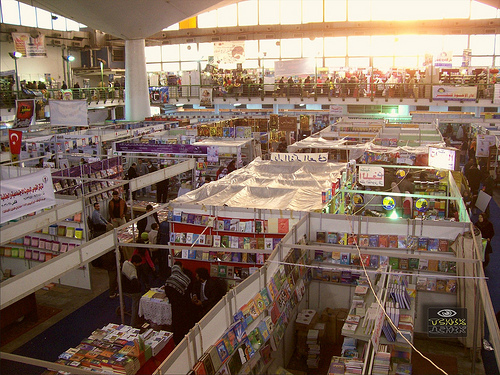 There was an initial, gradual decline in participation after the fair’s founding year, but in 1982 the trend reversed and gradually more countries and publishers began to participate in the CIBF until the fair peaked in 2004 with 3,150 publishers, 97 countries represented, and about 5 million books. We have yet to determine why, but you’ll notice a sharp decline in the number of publishers, countries, and books available in the year 2005, according to stats on the CIBF’s website. Since the dip in 2005, the CIBF has started to pick up again, but the Jan. 25th revolution brought more changes. The fair, which was scheduled to start around the time of the revolution, was cancelled entirely in 2011, hurting sales for all those who’d signed up to participate. Larger bookstores, like AUC press, have reportedly sold more than 1 million L.E. worth of books during the week-long fair in the past. The 2012 book fair was a bit sluggish and slapped together at the last minute, but it still brought in nearly 2 million books and 745 publishers. By 2013 the fair seemed back on track with good attendance and all of the big name bookstores and houses in their usual spots. The writers of this site certainly ended up coming home with more books than we’d intended to. And in 2015, there are reported to be 850 publishers taking part, up from the 755 publishers (518 from Egypt, 210 Arab, 27 non-Arab) who participated in 2014. The book fair was delayed by a week in order to avoid the anniversary of Jan. 25th. Within the past decade or so, the CIBF has begun to suffer from censorship and even some confiscations at the hands of the Egyptian police. Officially there is no state censorship in Egypt, and the position of the state censor or raqeeb was done away with in the 1970s. However, controversial books like Moroccan Mohamed Choukri’s For Bread Alone (transl. Paul Bowles, 1973; original Arabic 1982) and Syrian Haydar Haydar’s Banquet for Seaweed (1983) have been seized more than once at the CIBF. In 2001 prominent publishers like the Lebanon’s leading literary publishing house Dar al-Adab and the German-based Arabic publishing house Dar al-Jamal spoke out against unprecedented censorship and confiscation of their books, an act that took them completely by surprise at the CIBF. Censorship at the CIBF made the news again in 2005 and 2006 when several journalists were arrested and charged with disseminating false propaganda at the fair, and yet again in 2008 when several titles, including works by Milan Kundera and the aforementioned Choukri, were confiscated at the Cairo airport without explanation. While most publishing houses have chosen not to boycott the CIBF based on such acts of censorship, some small yet prominent publishers and houses, including Mohamed Hashem of Merit, who was among those arrested in 2006 at the fair, have opted not to attend the CIBF nor sell their books there in recent years. In 2015, there has been a fair amount of press coverage given to the removal of books by Youssef Al-Qaradawi and Sayyed Qutb from Dar El Shorouk’s bookshelves at the fair. For visitors to this site who’d like to participate in the CIBF, check out their website (link above) for more information. Note that even when the English site is up and running, the Arabic site is much more comprehensive and reliable. The deadline for participation usually falls in November, and prices vary for Egyptian versus foreign publishers. For those in Cairo who would like to have their books sold at the CIBF but can’t afford a table, there are a handful of publishing houses like Afaq and bookstores like Tanmia that provide this service, working out an agreement with individual houses that cannot or do not themselves participate in the CIBF.